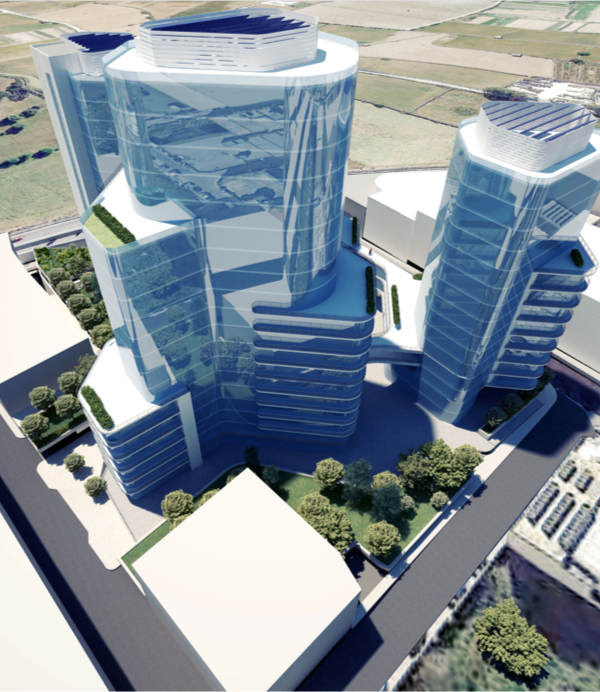 Located in the centre of Malta, on a superficial site area of 11,200 square meters, The Quad Business Towers is set to become a business address like no other. Targeting the highest LEED certification, the development takes the form of four tower blocks of varying height, ranging between 13 and 19 storeys, organised around a central piazza and resting above a commercial pediment. Set to deliver over 44,000m² of commercial floor space, this outstanding development will include a mix of Grade A office space and a range Retail and amenity outlets that will truly make a difference in the daily lives of our tenant community. Ample parking facilities and spacious landscaped outdoor areas and piazzas, have been carefully crafted to offer an inclusive, top-quality business environment. The Quad Business Towers are being developed by the Tumas Group and the Gasan Group and designed by leading architectural firm DeMicoli & Associates, all committed to deliver this extraordinary new centre of business, that will set the standards the workspace of tomorrow. Special Designated Area – The Quad Business Towers has been granted an SDA (Special Designated Area) status, essentially allowing both EU and non-EU nationals the same acquisition rights as Maltese citizens, without AIP (Acquisition of Immovable Property) permit requirements. When transacting property within a Special Designate Area, there are no limits on the amount of properties a buyer can purchase and importantly, purchased property may be leased out without restrictions. Intended as top-end developments and inclusive of a comprehensive facility and amenity offering, properties within SDAs are an immensely popular investment choice with both international and local investors.